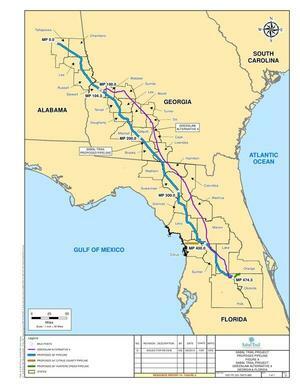 Facebook event: Due to local opposition to an unnecessary fracked methane pipeline, the Federal Energy Regulatory Commission (FERC) made Sabal Trail (FPL and Spectra Energy) produce four new route alternatives, and FERC set a deadline of November 15th for comments on them. Or comment about effects on your land, water, wildlife, or risks of sinkholes, leaks, or explosions, or your taxes that would have to pay in case of disaster, or the lack of need for this pipeline, or whatever else you want to tell FERC and the world. Everybody who is signed up for the docket on FERC’s ecomment system sees your comments. Plus you can send your ecomment to your local newspaper as a letter to the editor or op-ed, or call in to local talk radio, or volunteer to be a guest or to be interviewed on radio, TV, or newspapers. And don’t forget to contact your local county, city, state, and local elected and appointed officials, all of whom can object to this pipeline, many of whom could deny permits or pass resolutions or ordinances against it. If enough people stand up to defend their homes, children, water, and taxes from this invader from Texas, Sabal Trail may decide to do what Williams did with the Bluegrass Pipeline in Kentucky: cancel it. And you can ecomment to FERC saying you did that.